I thought you'd like to know how the Kennebec River fishing is shaping up. This report is based on info from friends and fellow guides who are tearing them up on the River right now! (The are photos from last year but this report is on the current action.) I'm finishing up my last days of guiding on Charlotte Harbor in Florida. I'll be leaving for Maine on June 9th to join in the fun! Conditions: The first schools of striped bass have arrived in the river. Water temps are a bit below average for this time of year and the water is a bit turbid due to rain. The lower river has a good amount of juvenile Atlantic Herring and sand eel. Fishing tactics: The schoolies are feeding on the surface while the tide is moving. Watch for birds and splashing. When they are not in the surface move around looking for them with your sounder on near by structure. My Flyfishing tip of the week: The fly line of choice for striped bass a 300-450 grain shooting head. But it always a good idea to have a second rod rigged with a floating line and surface fly such as a gurgler or a crease fly. 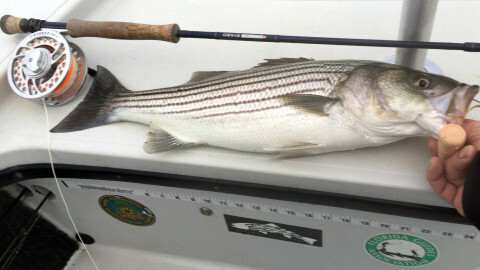 My spin fishing tip of the week: This time of year the stripers are feeding on small bait 1''-3" long. Small metal lures and small bucktails imitate them the best. 7 day outlook: More showers and drizzle coming this week. 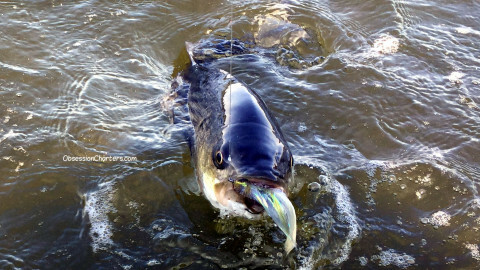 Striped bass love to feed during overcast conditions... Temps will be in the 50s & 60s. Late morning low tides will provide great fishing opportunities. 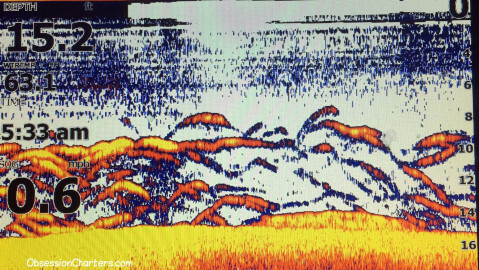 When the surface action stops the stripers stack up on structure and banks close by. The River has several schools of striped bass from 12"-26" in it right now!